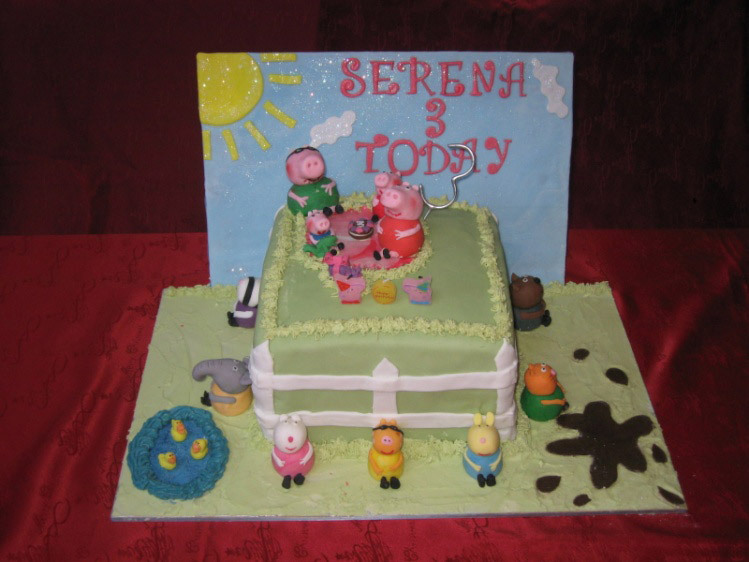 So my daughter’s birthday was coming up and all I knew was she is peppa pig mad. She loves this very irratating little pink thing! 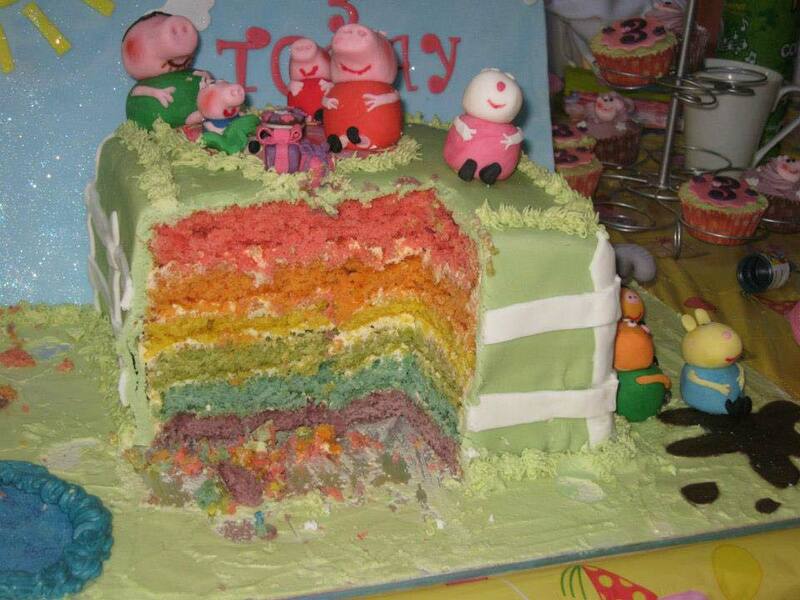 My house is full of every peppa pig thing you can think of, so it’s no surprise I made a peppa pig cake. This was no regular birthday cake though, oh no, this was my first attempt at doing a fully iced cake with lots of details and also it was a rainbow cake on the inside (which wasnt planned). We don’t do things by halves in my house guys! I started by getting my soon to be father in law to cut me out some boards I could use to make my master piece on because I knew a regular cake board just wasnt gonna cut it. Then, well then I just let my imagination run riot! I had no plan and no idea what I was doing. I’ll be honest with you now, it’s not the cleanest looking cake and by no means perfect, but my God was I happy with it and more importantly, my daughter loved it. 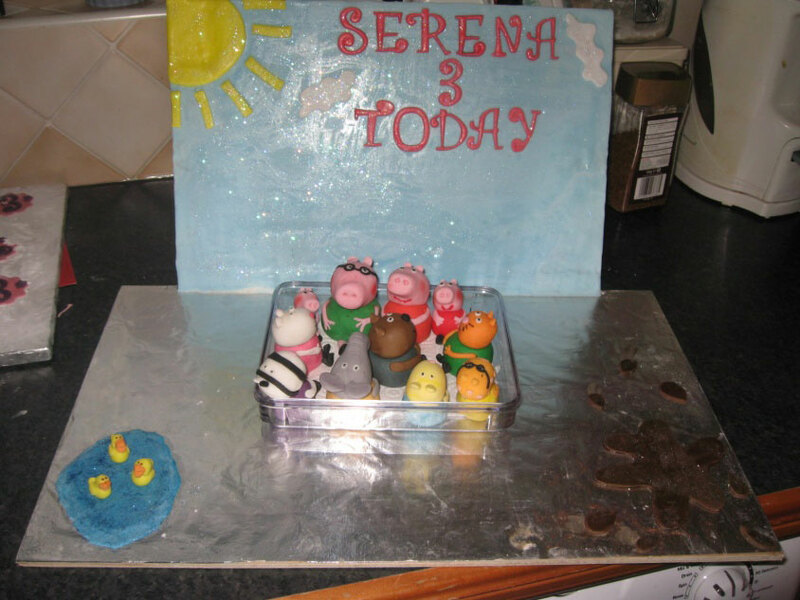 Heres a couple of photos of the making and putting together of the cake. 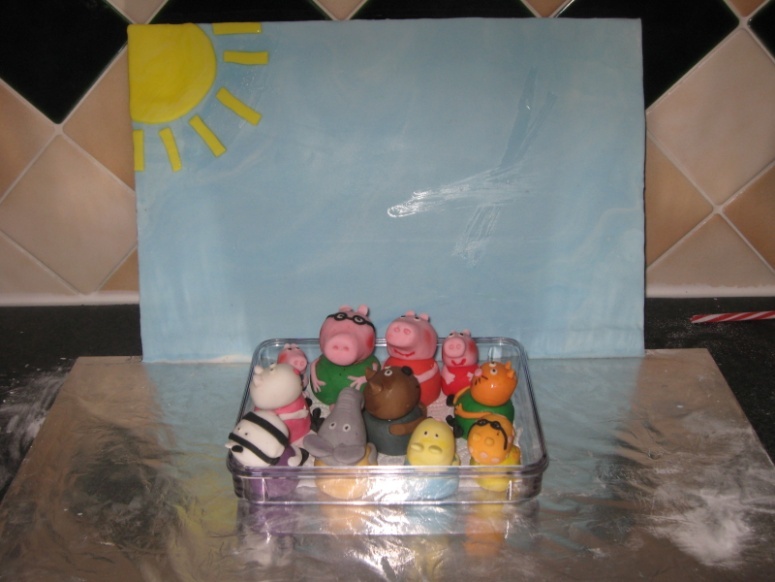 These are the little figurines I made for the cake and also the start I made on the boards – all in the first night. Just in case your lucky enough not to know who these guys are I’ll give you their names. Starting from the bottom left corner say hello to Zoe Zebra, Suzie Sheep, George Pig, Daddy Pig, Mammy Pig, the infamous Peppa Pig, Candy Cat, Pedro Pony, Emily Elephant and in the middle, Danny Dog. Next we have some more details added on the board, in the form of Peppa’s favourite muddy puddle and a little duck pond. After lots of fiddling around, this is how I wanted to lay the cake out. Then, after what felt like an age baking the rainbow cake insides, and even longer again spent trying to cover it (not easy with such a tall cake and also my first time actually doing it) – this is what I ended up with. 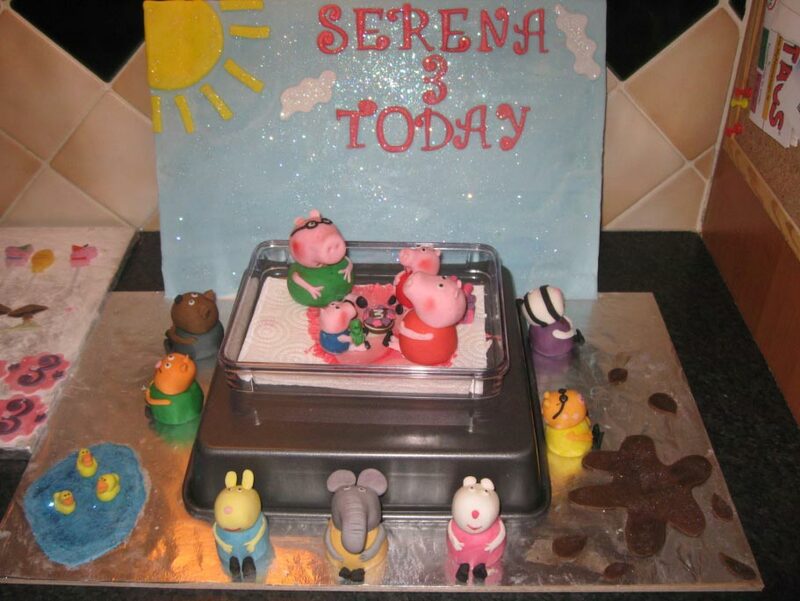 My daughter loved it and couldn’t wait to bite Peppa’s head off! When the happy birthdays were sang I got my soon to be sister in law to cut into the cake (I was half afraid of what might be there) but as you can see it worked and looked fab even if I do say so myself. 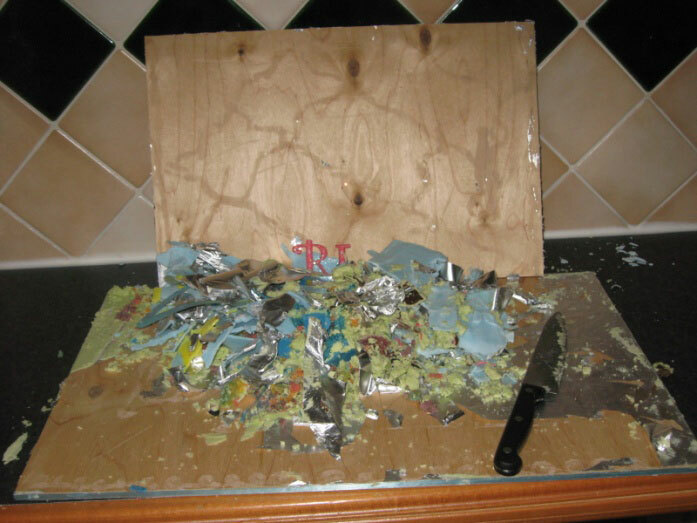 When the party was over and the remaining cake was eaten, I ended up hacking the icing off the boards an here was what was left! Thank you for visiting my site and please feel to connect with me on Facebook or share my post on any of your favourite social media sites below. This all started as a hobby and after many months of contemplating whether to do something useful or not, here I am :) I have had a lot of support from family and friends and also a lot of cakey people on the web and Facebook so thank you to everyone. Whilst I mainly bake cakes, cupcakes and cake pops, if there is some other sweet thing you would like please contact me and I will let you know if I can help.